Here in the past few weeks we have lost at least two celebrities to suicide. The main one that was a complete surprise was Robin Williams. I sat back and read the stories and watched the discussions on Facebook and other social media. I saw everything from outpouring of sympathy to those who said he had no reason to kill himself. He was a celebrity, had money, and he shouldn’t have been depressed. I was curious why a person who has money or fame shouldn’t be depressed. Anyone can become clinically depressed. I’m not talking about how someone can feel blue or down because they are having a bad day or even a bad week, but then they are able to get themselves out of it and move on. I’m talking about a debilitating condition where even getting out of bed is almost impossible. The type of depression where you sit in front of your computer knowing you need work, but can’t even get your hands on the keyboard. This type of depression needs medical attention. Just because you have money or fame or power once you are hit with this type of depression you need help. I remember just a few years ago no one talked about mental illness. Everyone knew that Aunt Sally was depressed, but nobody talked about it. They just watched her sit in the chair and cry for hours, but instead of getting her help, they just left her alone and hoped she got out of her slump. When you are that down and deep in your depression, being left alone in your own illness only makes things worse. There is no shaking yourself off and manning up, as there is such a weight on you that you cannot even function. I remember right after my third child I went into a deep postpartum depression, but no one knew what it was. I just knew something was wrong with me, but didn’t know what. It took women killing their own children due to their postpartum psychosis for the general public to finally realize there was a problem. Depression is one of those horrible conditions where unless you have gone through it you have no idea what the person is really going through. I mean most people have no idea what it feels like to truly feel like the best thing you could do is dig a hole somewhere and just crawl in it. I have to admit years ago I had the same mindset. I would see these rich celebrities overdose on pills, kill themselves, etc. 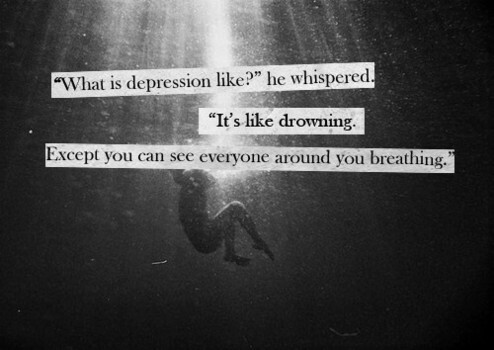 and wonder what they had to be depressed about and then the depression hit me and I understood completely. I know and so does my family that if I do not take my “happy pills” I’m not very happy. I am not talking about just being down, I’m talking about being to the point of wanting to punch out random people, crying for no reason, and other behaviors that are completely opposite of my normal self. Once I realized that I was no fun to live with I knew it was time to go back on my medication and stay on it. Society is much more understanding about mental illness than it used to be. There have been enough TV shows, commercials, books, etc. that have educated people on the fact that a mental illness is just as real as a physical illness and needs to be treated, but we all need to realize that celebrities are just people and are as susceptible to depression as the rest of us. When something tragic happens like Robin Williams we need to show concern as to what put him in that mindset instead of saying he was a celebrity, so he had no reason to kill himself. Depression doesn’t discriminate, it can hit anyone from any social class and if you are afraid your loved one or friend is showing the signs of depression it is time to take action. Telling them to snap out of it or get over themselves is not going to work, but suggesting they see their primary care doctor or talk to a counselor could get them the help they need before the disease takes them over and takes their life. Being depressed doesn’t mean you are crazy or just being stupid, it is a real condition that is treatable, you just need to find help before it is too late. Until next time….